“As previously guided, Q1 PAT fell by 20% to €319m due to lower fares, the absence of half of Easter in the quarter, higher oil prices and pilot costs. Traffic grew 7% to 37.6m, despite over 2,500 flight cancellations caused by ATC staff shortages and ATC strikes. 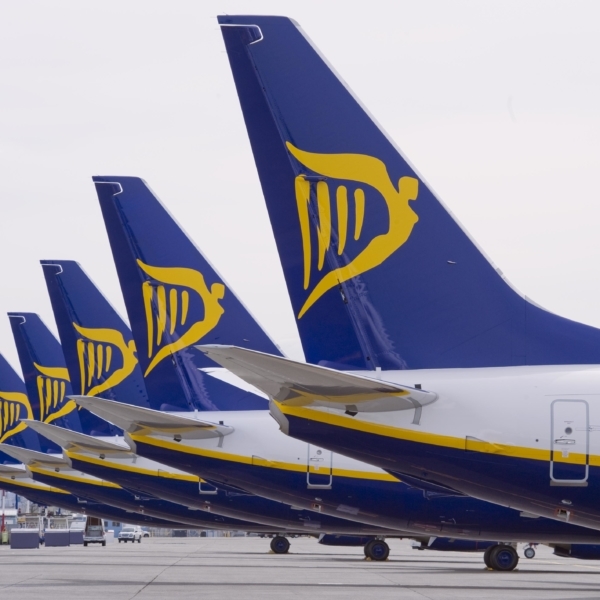 Ryanair’s lower fares delivered an industry leading 96% load factor. We took delivery of 14 B737s in Q1 (bringing our fleet to over 440 units) and launched 239 new routes for S.2018. Bookings are slightly ahead of last year, but at lower fares. We continue to see overcapacity in the European market, with Germany in particular very price competitive this summer. Q1 fares fell 4% to under €39 and we expect this weaker pricing environment (due to the World Cup, the Northern European heat wave and customer uncertainty about pilot strikes) to continue. Our investment in Labs and AGB continues to drive improvements in ancillary revenue to 30% of total revenue in Q1. Key drivers of this growth was improved conversion of reserved seating and priority boarding services. Ryanair’s digital platform now has over 1bn visits p.a. and continues to grow. Ryanair has significantly lower costs per passenger than our competitors. Fuel prices have risen substantially from $50pbl at this time last year to almost $80pbl in Q1. While we are 90% hedged at $58pbl our unhedged balance will see our full year fuel bill increase by at least €430m (incl. additional volumes). We recently hedged 35% of H1 FY20 at $69pbl. Q1 staff costs increased by 34% primarily due to pilot 20% pay increases, 9% more flight hours and a 3% general pay increase for our non-flight staff. EU-261 “right-to-care” costs jumped 40% in Q1 due to over 2,500 ATC flight cancellations in Q1. For the remainder of FY19, we will continue to invest in our people, our systems, and our business as we scale up to take delivery of 210 MAX-200s (“Gamechangers”). These aircraft have 4% more seats and 16% lower fuel cost, and we expect them to deliver material unit cost reductions from FY21 onward when we start to retire older B737-800s. Our operations continue to be strongly cash generative. Capex of €460m and shareholder distributions of €265m in the quarter were financed from strong cash flows while still cutting net debt from €283m in March to €259m at end June. Our €750m share buyback programme is 70% complete, at an average price of €15.90. When complete later this year, we will have returned over €6bn to our shareholders since 2008. Repeated ATC staff shortages (mainly in UK, Germany & Greece) and strikes (France) are causing widespread damage to airline schedules this summer. French ATC, the worst offenders, went on strike for 9 of the 13 weekends during April, May and June leading to thousands of cancelled flights. Ryanair cancelled over 2,500 flights (approx. 450,000 guests) in Q1, with a loss of higher yielding weekend traffic, and a steep rise in EU261 “right-to-care” costs. Punctuality was severely damaged (with only 75% of Q1 flights on-time compared to 89% last year). Ryanair and other airlines have initiated legal action against the French Government to keep Europe’s skies open during these unacceptably frequent French ATC disruptions. Ryanair and A4E (Airlines for Europe) are campaigning for the European Commission to take control of the upper air space so that overflights, at least, are not disrupted during national ATC strikes. This does not remove the “right to strike” but does confine more of the impact of strikes to the actual country where the strike occurs (i.e. France). Regrettably, the European Commission remains slow to act on these measures and we call again on the EU to act decisively to minimise the impact of ATC disruptions to EU consumers and their families this summer. With fuel at $80pbl (up from $50pbl last year), some weaker, unhedged, European airlines are suffering a significant cash flow squeeze and/or are close to breaching debt covenants. We expect this will lead to further airline failures and consolidation this winter, which will provide growth opportunities, hopefully at stronger yields for Ryanair’s low fares/low cost model. In recent months we implemented a series of initiatives to make Ryanair more attractive to pilots and cabin crew, including (a) a 20% pay increase under 5-year pay agreements which makes our pilots significantly better paid than competitor (Norwegian & Jet2) B737 pilots; (b) we cut training/bonding costs for new pilot and cabin crew recruits; (c) we facilitated over 700 pilot transfers to their preferred base; (d) we invested heavily in new simulators and in house training capacity; and, (e) we announced we would recognise trade unions. Despite signing pilot and cabin crew union recognition agreements in our major markets (the UK and Italy, and a recent agreement in Germany for cabin crew), progress has been slower in smaller markets where competitor pilots are impeding both progress and process. We suffered 2 unnecessary strikes by a small minority (25%) of Irish based pilots in July (with a 3rd strike threatened for 24 July). Cabin crew have also threatened strikes in Spain, Portugal, and Belgium on 25 & 26 July. We have minimised the impact of these strikes on customers by cancelling a small proportion of our flight schedule, well in advance of the day of travel, to allow our customers to switch flights or apply for full refunds. While we continue to actively engage with pilot and cabin crew unions across Europe, we expect further strikes over the peak summer period as we are not prepared to concede to unreasonable demands that will compromise either our low fares or our highly efficient model. We remain concerned by the danger of a hard (“no-deal”) Brexit in March 2019. While there is a view that a 21-month transition agreement from March 2019 to December 2020 will be implemented (and extended), recent events in the UK political sphere have added to this uncertainty, and we believe that the risk of a hard Brexit is being underestimated. It is likely that in the event of a hard Brexit our UK shareholders will be treated as non-EU. We may be forced to restrict the voting rights of all non-EU shareholders in the event of a hard Brexit, to ensure that Ryanair remains majority owned and controlled by EU shareholders. We have applied for a UK AOC to protect our domestic UK routes and hope to receive it before the end of 2018. We continue to guide FY19 PAT in a range of €1.25bn to €1.35bn. While Q1 fares were marginally stronger than previously expected, the recent weaker fare environment and the expected impact of crew strikes on forward pricing mean that Q2 fares will only rise by approx. 1% (previously guided +4%). With almost zero H2 visibility, our H2 guidance of broadly flat fares remains unchanged at this time. Ancillary revenue continues to perform well but will not offset a €430m higher fuel bill or a 6% increase in ex-fuel unit costs. This guidance is heavily dependent on close-in Q2 fares, crew strikes, continuing ATC staff shortages/strikes, the absence of unforeseen security events and no negative Brexit developments.